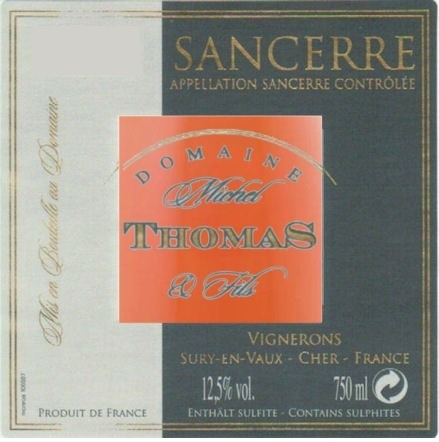 Thomas Sancerre Rose is made from 100% Pinot Noir. Vines are 20-55 years old. Terroir (soil type) is a blend of "Caillottes" and "Terre Blanche". Everything is machine harvested (which means it is 100% destemmed). 50% Direct press + 50% Saignée (bled) with 12-24 hours of skin contact maceration. The alcoholic fermentation is done in temperature controlled stainless steel tanks. Right before bottling, the wine is fined with Bentonite (very light filtration with oenologic clay). Light, bright pink. Redcurrant, strawberry and chalk on the nose, with a touch of singed orange gaining strength with air. Dusty red fruit and citrus flavors are braced by tangy minerality, which adds lift and cut. Uncompromising in the best way, finishing with excellent clarity and echoes of lemon and orange zest. This is a very versatile wine. You can have it on its own in the summer time as an apéritif. But it is also excellent with Hors d'Oeuvres and terrines. It will compliment any white meat dish and poultry. You can also enjoy it with salmon or exotic food (slightly spicy sushi). "One of our favorite rosés in our 2017 annual rosé review, the Michel Thomas Sancerre is a complete wine. Pale salmon in color with a red cherry skin scent, the wine is full in the mouth with clean red cherry flavors. It has good balancing acidity and a lingering, rich finish." Michel Thomas and his son Laurent took over the estate in 1970 from Michel's father, who started in 1946. The total production is about 10,000-12,000 cases per year. They export 65-70% of their production, mainly to Japan and Russia. Today they farm 40 parcels located in four villages, totalling 17 hectares (42 acres): 11 hectares Sauvignon, 6 hectares Pinot Noir. The special bottling "Silex" is limited each year to between 400-500 cases. They grow grapes on three soil types: 40% Terre Blanche-Argilo-Calcaire, 40% Caillottes-calcaire, 20% Le Roc-Silex. Romariz Pink Port is from a blend of red grapes port is the beautiful deep pink color extracted. Then rose postage, like white port, vinified without the skins. Despite Romariz not the Fonseca label bears, this port by a team led by David Guimaraens. The grapes after pressing 7 days sur lie cold fermented. This slow fermentation, which lasts twice as long as usual, brings a delicious berry hurry up and crisp, bright and airy style that is so characteristic of Romariz Pink Rose Port. Aromatic fruit aromas of raspberries and currants with floral tones. Full, fruity taste with ripe cherries and raspberries and notes of honey and of course grapes. Modern, bright and airy style. Romariz Pink Rose Port is a delicious appetizer with a lump of ice, but can also be combined well with fruit desserts. Furthermore, this port is an interesting combination as long drink with tonic and a slice of lemon.